The Moments were a prolific sweet soul group in the 70s, signed up by Stang Records and regularly in the charts. They comprised vocalists who would later become Ray, Goodman & Brown. As The Moments their first US R&B No.1 was “Love On A Two-Way Street” in 1970 and in the UK were best known for “Nine Times”, “Dolly My Love” and “Girls”. When they changed labels, a handful of songs were left unissued including the incredible “Sleep Won’t Come”, first released as a CD bonus tracks on a 2CD Moments anthology “Moments To Remember”. 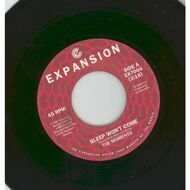 Interest in the songs has become high since that time resulting in an inevitable debut release on vinyl here on Expansion. The B side is one of the group’s most underrated gems.